Punxsutawney Phil is the groundhog who emerges from his borough in Pennsylvania to predict whether we will have six more weeks of winter-like weather. Punxsutawney is located in Western Pennsylvania, about 80 miles north-east of Pittsburgh. If Phil does not see his shadow, he has predicted an “early spring” but if he does sees his shadow and returns to his hole, he has predicted six more weeks of winter. Groundhog Day 2019: When is Groundhog day - what is it? Groundhog Day 2019: When is Groundhog Day in the US this year? 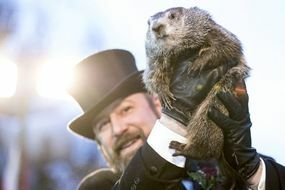 Phil is at least 132 years old, according to the Inner Circle of the Groundhog Club in Punxsutawney. However this would physically be impossible as each ancient groundhog lives to be between six and eight years. He reportedly takes a magical potion each summer to extend his lifespan. The magical elixir also changes his appearance, which explains why Phil may be grey one year and a youthful brown the next. He is fed the potion every summer at the annual Groundhog Picnic that apparently extends his life for another seven years. The first official Groundhog Day was celebrated on February 2, 1886, in Punxsutawney, Pennsylvania.